Another fantastic recipe! Quick and easy, which was just what I needed on a day where I was NOT motivated to cook. Fresh ingredients, deliciously spiced, easy as pie (or tacos) and not much mess! I say that because usually I'm a very messy cook! I can't help it - I don't like things to touch so I use a ton of plates, paper towels, etc. etc. But on to the recipe, shall we? 1. Wash and dry all produce. Pick cilantro leaves from stems and discard stems. Halve lime. 2. Toss red cabbage, carrots, mayonnaise, white wine vinegar, 1 tsp blackening spice, juice of half a lime, and 1 tsp sugar in medium bowl. Season with salt and pepper. 3. In another medium bowl, toss shrimp with cornstarch, remaining blackening spice and pinch of salt and pepper. 4. Heat a large drizzle of oil in a large pan over high heat. Add shrimp and cook until opaque in the center and golden and crusty on the outside, about 2 minutes per side. 5. Warm tortillas - either in a damp paper towel in a microwave for 30 seconds or (as I do) on a pan on the stove - warming on each side for about 30 seconds each. 6. 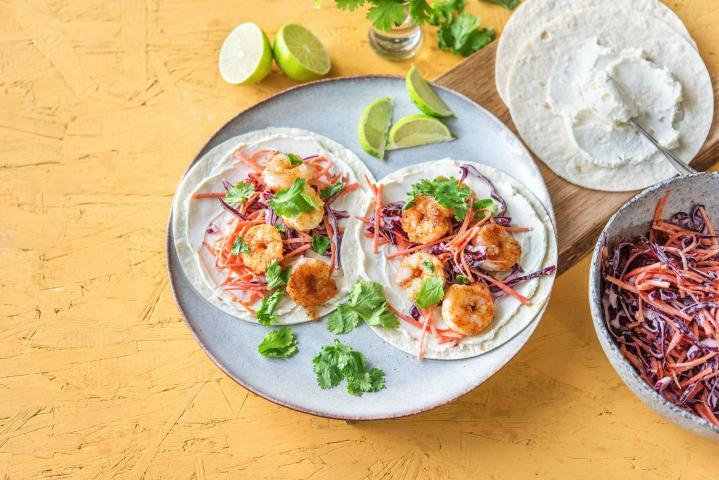 Fill each tortilla with sour cream, slaw, shrimp, cilantro and lime juice.